Give things sensible names. It’s okay to give your tool itself a clever or silly name; if you’re writing Python it’s actually required by law. Things that are within your tool should have names that make their meaning obvious. That doesn’t mean that choosing the name is obvious. Trying to name things well can take hours. Use consistent names. These three names all refer to the same thing in Git. Don’t be like Git. Be consistent between different parts of your own CLI. TaskWarrior has tags, it has dynamic tags, and it has different places where tags are used. In every case, tags are denoted with a plus at the front. Be like TaskWarrior. Different git subcommands have different ways to delete things. Don’t be like Git. Here’s why. This will try to create a branch named ‘rm’. I do this all the time. Be consistent with the ecosystem you’re in. If you use the built-in argument parsing library in Go, it expects a single dash before every flag, rather than a double dash. That means everyone using your tool has to remember “oh, this is a weird Go thing, I need to use it differently to what I’m used to”. Use a library that lets you do what your users expect. Don’t go overboard on consistency. Sometimes doing things a little differently actually makes sense for your users, if you’ve thought about it and you have a good reason for it. This is a switch statement in Bash. What’s going on here? Why are there unbalanced parens? What the hell is an esac? This is a switch statement in the Fish shell. It’s much easier to understand. It’s also not POSIX compatible, but that’s okay. You don’t need to be all things to all people, especially if you’re sacrificing usability for it. Have good defaults. you might not think of defaults as being part of your user interface, but they are. Docker has sane defaults, so people don’t shoot themselves in the foot. Because of Docker’s defaults, I don’t even need to understand namespaces or capabilities or all the things Jess talked about this morning to start using it, even though I can learn about them and adjust the dials later. This is why Docker is popular. Firewalld in fedora ships with every incoming port over 1024 open by default. Users expect their firewall to block things by default, and this is the exact opposite. Don’t be like firewalld. On a similar vein, configuration files are also part of your UI. Use a common format that’s clear and widely understood, so that your users only have to think about the actual configuration they’re doing, rather than your crazy custom syntax too. Don’t ship a default configuration file with a million things in it; that just makes it hard for your users to keep track of what they’ve changed. When your default config is an empty file, your users can also roll back to default by just deleting everything. Your sane defaults should kick in for a particular option if it’s missing. Document everything. Command line options, config files, interactive-mode behaviour. Use lots of examples. Writing good docs is an art in an of itself. If you do nothing else, do this. Why should we care about CLI user interfaces anyway? These things are for developers and operators! They’re Computer People! They can just figure it out! We do not have infinite memory. The less I have to understand and remember about your tool in order to use it, the better. We did not emerge from our mothers’ wombs with an intricate understanding of Git’s underlying data model. The easier your tool is to use, the less time it takes to learn, the more time your users can spend on important things. 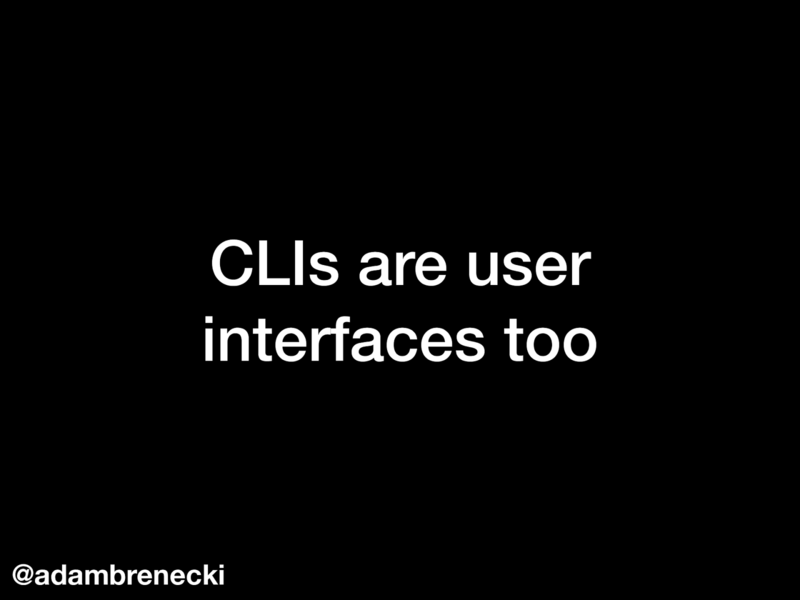 View CLIs are user interfaces too (lightning talk) on Notist.